"The support act Rey Toro left the stage at 8.50pm, less than half an hour later the lights went out, and a one minute "arabic-rapture" intro (in complete darkness) was suddenly broken by the intro of Pictures of Home. The audience (I'd estimate 8,000) were for the most part seeing Purple for the first time...I saw old rockers, kids....all jumping, singing.. I'd never seen anything quite like it before. The band were superb!! I saw them in Argentina last year, but have to say this time they played in a different way, more relaxed...enjoying every song!!! Each of the musicians played in an excelent way -the sound was also spot on. Star of the night was Gillan, who sang Into the Fire as if In Rock had only been released last month! Unforgettable night." "Deep Purple are really getting better and better. 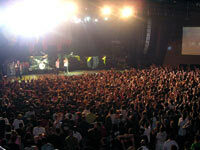 About 7,000 people including very young fans attend the gig. What a show ! The band don’t have the speed and impetuousity of old, but the energy, capacity and technique have improved. I really enjoyed hearing Into the Fire live for the first time, and the new songs - especially Wrong Man and Things I Never Said. 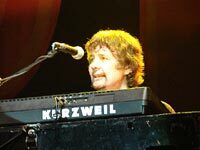 Don Airey played the folk song “Canto Alegretense” at the piano, and there was some nice improvisation before Highway Star and Black Night. The musician of the night: Roger Glover." 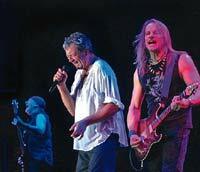 "My first Deep Purple concert, an unforgettable night in my life. Their performance was so much better than how they appear on videos and DVD. "Into The Fire" was perfect, and "Kiss Tomorrow Goodbye" really showed the power in Gillan's voice, but the best performance of the night was "Perfect Strangers", during which the sound was at its loudest- shaking the walls to their foundations. A perfect night for the 4,000 strong crowd. Set list: 01. Pictures Of Home / 02. Things I Never Said / 03. Into The Fire / 04. Strange Kind Of Woman / 05. Rapture Of The Deep / 06. Fireball / 07. Wrong Man / 08. Steve Morse guitar solo / 09. Well Dressed Guitar / 10. Kiss Tomorrow Goodbye / 11. When A Blind Man Cries / 12. Lazy / 13. 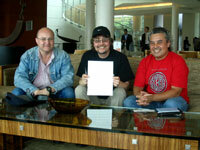 Don Airey solo / 14. Perfect Strangers / 15. Space Truckin’ / 16. Highway Star / 17. Smoke On The Water. Encore: 18. Hush / 19. Black Night. "Deep Purple performed two songs live on "Programa do Jô", on Monday, November 27th - "Smoke On The Water" and "Rapture Of The Deep", ending with a boring 15 minute interview (not due the band, but the host)." "Just to let you know how to watch the whole interview. Open http://gmc.globo.com. You´ll find some tabs with "notícias"/"esportes"/"entretenimento" then, "VIDEOS", CLICK ON IT. On the next screen, you´ll find different menus (diff colours as well) on left side, the first one is "especiais", the second one is "ENTRETENIMENTO". Pull down the menu and find "´PROGRAMA DO JÔ". Click on it. You´ll come into a screen which has a picture attached. Look for the pic with Ian Gillan and Don Airey, or Ian Gillan singing. You have the interview and "Smoke On The Water". Good luck!" 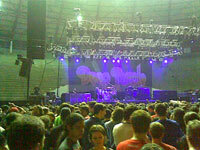 "I´m just back at home after the second night of Deep Purple in São Paulo. Tonight was much better than the first, when Ian Gillan sounded constipated, and the whole band performance was what I would call "bureaucratic". That would normally be acceptable, but not when you're talking about Deep Purple. The venue was packed for both nights, with about 2,500 people in this small venue (the smallest Deep Purple have ever played down here, maybe to match the poor promotion). The set list was the same as before, except for "Living Wreck" replacing "Into the fire". All solos were longer than the first night, especially in Steve´s spot." Set List : Pictures of Home / Things I Never Said / Into the Fire / Strange Kind Of Woman / Rapture Of The Deep / Fireball / Wrong Man / Steve Morse Solo ~ Well Dressed Guitar / Sometimes I Feel Like Screaming / Lazy / Kiss Tomorrow Goodbye / Don Airey Solo ~ Perfect Strangers / Space Truckin' / Highway Star / Smoke On The Water / Roger Glover Solo ~ Black Night. Las etiquetas sitúan a Deep Purple como un emblema, un punto de referencia ineludible dentro de la historia del rock más duro, después de casi cuatro décadas en las rutas. Sus músicos, en cambio, prefieren escapar del letargo de las estatuas. "Algunos lucharán por llegar al salón de la fama del rock, pero lo nuestro no pasa por ahí", aclara Ian Gillan, imagen y voz del grupo inglés que comenzó a rodar por los escenarios a fines de los sesenta. En una charla exclusiva con Clarín, en una habitación despojada de excentricidades, dos de los integrantes originales de la banda que experimentó el heavy metal, pero también coqueteó con el rock sinfónico y la música clásica, hablaron del show que darán esta noche en Obras -parte de la gira Rapture of the Deep-, de los cambios que marcaron a fuego al grupo y del lugar que creen ocupar dentro de la historia del rock. Deep Purple sufrió muchos cambios. Cómo sobrevivió la banda? Paice: Si mirás la vida de una persona durante treinta o cuarenta años vas a ver un montón de cambios. Esto es como una familia que tiene divorcios, muertes, nacimientos... Pero las familias sobreviven. Y esto es una familia. Cuál es el secreto para seguir vigente a pesar del paso de los años? 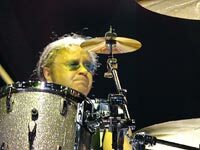 Paice :Es que somos mejores que cuando teníamos 25 años (risas). Qué sienten cuando un padre que disfrutó "Machine Head" comparte un show junto a su hijo, que también conoce los temas? Gillan: El público es increíblemente joven. Y nos da mucha energía. Tengo una hija que escribe hip hop hace un año y que ahora está empezando a ir a las raíces. Está escuchando a Ray Charles, a Elvis Presley, a Nat King Cole. Lo que sentimos con este tema del público joven es que estamos volviendo a ser parte del underground. Cuál es el futuro de la banda? Paice: Mientras sigamos en forma tocaremos en vivo, que es lo que más nos gusta. Qué lugar creen que ocupa la banda en la historia del rock? 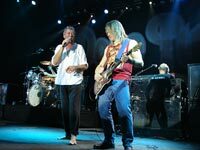 Gillan: No puedo entender muy bien esto de la historia del rock. El mejor show que di en mi vida fue para cuarenta personas. Y no se lo acordará nadie. Y el mejor disco que grabé sólo vendió doscientas copias. Paice: Dentro de cien años habrá un chico que escuchará un disco muy antiguo nuestro, y dirá "eso está bueno". Importa algo más? 19. Hush / 20. Roger's solo / 21. Black Night. 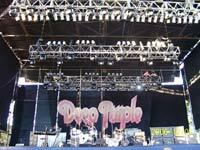 "Deep Purple performed an amazing concert at the Quinta Vergara open door venue. Roger Glover played monster bass lines through the whole set. Steve Morse played heavier and raunchier than ever. The venue was packed, and every song was received very enthusiastically. Prior to the concert, my girlfriend Ana María Buchholz and I met some friends for a drink at the Miramar Hotel in Viña del Mar, and spotted Don Airey nearby. After a friendly chat, he asked us if we knew any folk song which he could play a few bars of during his solo. He asked us to meet him at the lobby after five minutes, where my friend Ricardo Henríquez hummed the tune "Gracias A La Vida". Don transcribed what he heard, and wrote it down on blank score paper. The picture above shows Don holding the final transcription. That night he played the piece in his keyboard solo. Since I also play keyboards, it was an incredible experience to meet Don Airey. What a concert! " © 2006 DPAS/Darker Than Blue.